Over time, horses (like people) acquire postural habits, compensate for soreness and injury, and develop poor movement patterns. This limits performance ability, causes unsoundness and health issues, and ultimately undermines the horse’s overall well–being. Jec Aristotle Ballou has made a name for herself advocating for the horse and providing sensible instruction in his schooling, conditioning, and care. 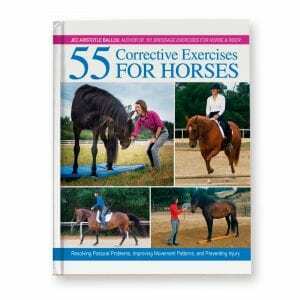 Her bestselling books and popular clinics are designed to enable any horse person to correctly apply proven principles that bring measurable progress while avoiding boredom and confusion. In her latest collection of mounted and unmounted corrective exercises, Ballou demonstrates how we can actively work to improve the horse’s posture and movement, whether he is an active performance or pleasure mount, an aging or older horse that benefits from gentle exercise, or one being rehabilitated following injury, illness, or lack of conditioning. Ballou’s positive cross–training techniques are free of shortcuts, and her guidelines for analyzing the horse’s posture and way of going help readers gain a new awareness of the equine body. Applicable for all disciplines, this is an integral collection that optimizes how the horse uses his body and helps ensure he stays sounder and healthier for more years of his life.